Failed or non-existent weeping tile is the most common cause of significant water problems. Weeping tile is a flexible, perforated plastic pipe that is designed to collect water from around the foundation and direct into a sump where it is then pumped away. Weeping tile used to be constructed from individual, hexagonal pieces of clay pipe tiles. The clay tiles have since been replaced by plastic, but the name has stuck. In most of Alberta and Saskatchewan, due to our clay soils, weeping tile is an absolute necessity if you want your basement to remain dry in the most severe conditions. We always include SuperSeal dimpled foundation wrap with our weeping tile installations. The dimple wrap replaces the old tar like damp-proof coating that has been used in some form for over a hundred years. It is far superior to the coating as it does not degrade underground, it provides an air gap between the soil and the wall eliminating hydrostatic pressure and bridges any potential future cracks. 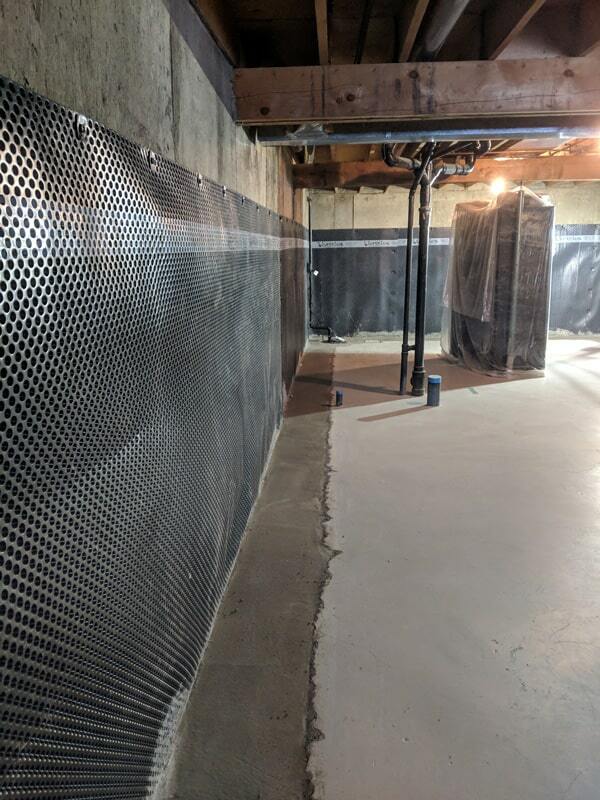 While positive drainage away from your home is an important part of keeping your basement dry and extending the life of your weeping tile system, positive drainage alone will not ensure a dry basement during extreme rain events. This is your first choice and most common method. In requires excavating down to the bottom of the footing. It includes sealing any cracks along with the wall/footing joint, installing the SuperSeal membrane, weeping tile and drainage rock and then backfilling. The concern most people have is the amount of damage to their landscaping. We have three different methods of excavating and corresponding pricing. 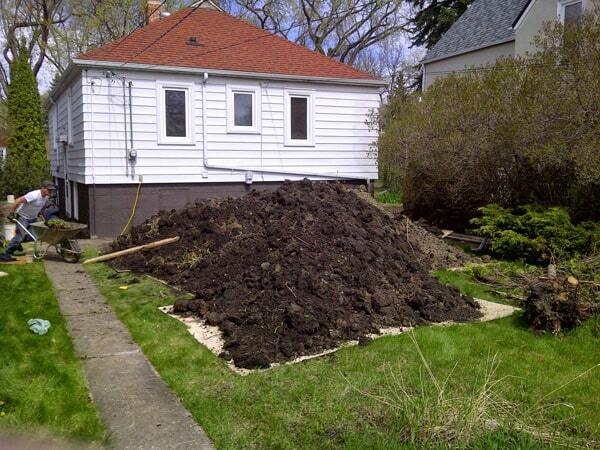 Excavating with small equipment and no lawn protection. When your hard landscaping, such as driveways, sidewalks, steps, decks, patios and planters are deteriorated and need replaced and the yard needs graded for slope correction, this is your most affordable and quickest solution. We still hand dig to expose services as needed. Excavating with small equipment with lawn and landscaping protection. We still use a mini excavator to dig, but the soil is placed on plywood laid over the lawn. 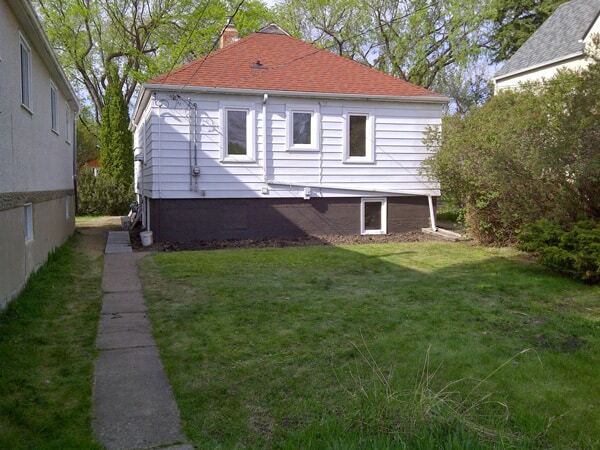 This limits the damage to the landscaping to no more than six feet adjacent to the house. It can still require removal of decks and steps. This is our most common method and results in minimal landscaping repairs. Full hand excavating. The trench is kept much smaller and we will tunnel under steps and decks. 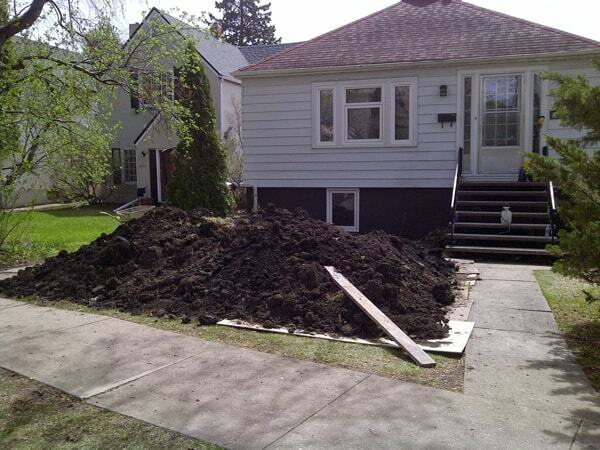 Damage to gardens and shrubs is kept to a minimum as our trench is only about 2 ½ feet wide. Most jobs are a combination of the above depending on landscaping and how much room we have for access. We leave all of the above options cleaned up and neatly graded. 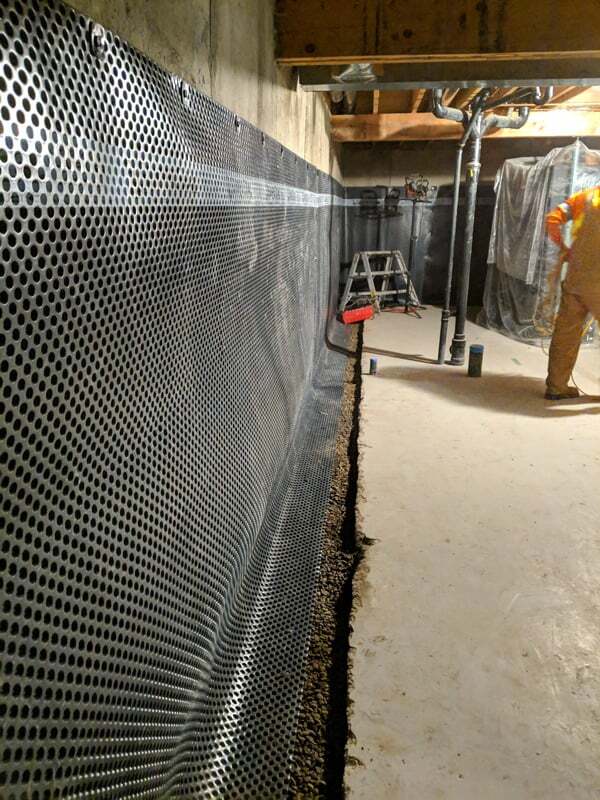 When exterior access is prohibitively expensive and the concrete walls are in sound condition, we can solve your water problems with an interior weeping tile and foundation wrap system. This can be a much more affordable solution if the interior finishes are damaged enough to require replacement anyway. We can complete this work anytime of year. 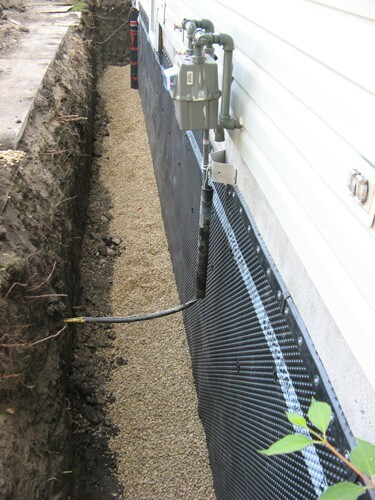 This type of system is also known as a French Drain. 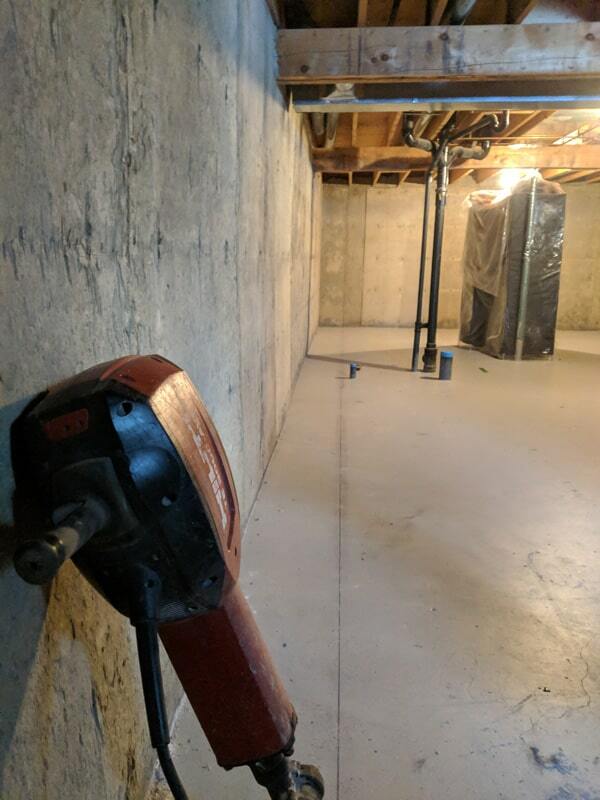 While some consider an interior system a compromise, the end result is still a dry basement that we put the same warranty on as the exterior system. The interior system is not an option for wood foundations. We have successfully repaired and waterproofed thousands of metres of cracks and leaks. 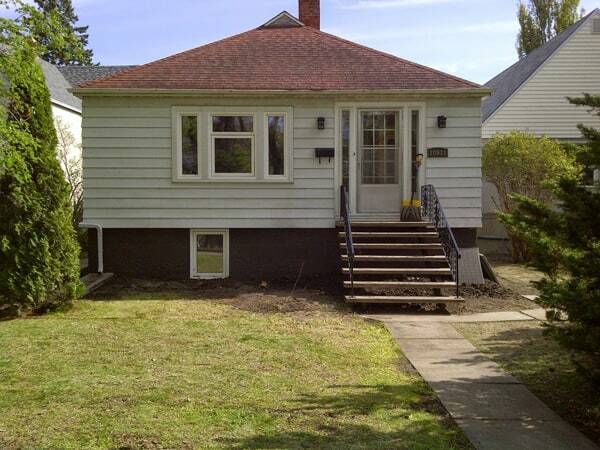 If you need leaky basement repair in Edmonton, call now for a free estimate.